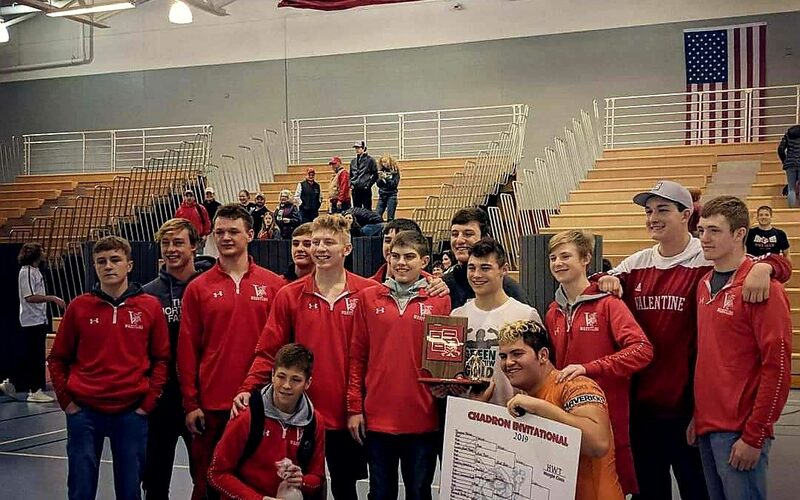 A shorthanded Valentine Team poses with the Mead, CO Heavyweight, who helped the team to victory over Natrona during the Chadron Wrestling Invitational. Big thanks to Robert Joseph for the picture and the reports throughout the day. Jarrett Battershaw (19-4) placed 2nd and scored 24.0 team points. Cody Miller (14-6) placed 6th. Chris Williams (23-1) placed 1st and scored 26.0 team points. Tobin Olson (15-8) placed 3rd and scored 18.0 team points. Conner Fowler (12-6) placed 5th and scored 16.0 team points. Gage Krolikowski (24-0) placed 1st and scored 25.0 team points. Drake Janssen (11-5) placed 2nd and scored 22.0 team points. Cameron Jordan (2-5) place is unknown. Tagg Buechle (3-9) place is unknown. Gunnar Battershaw (18-9) placed 3rd and scored 24.0 team points. Devon Osnes (13-8) place is unknown. Caleb Long (19-0) placed 1st and scored 25.0 team points. Lane McGinley (18-3) placed 1st and scored 25.5 team points. Ryan O`Kief (7-6) place is unknown. Rhett Witt (4-4) place is unknown and scored 3.0 team points.